Disaster recovery (DR) is one of most important use cases that we hear from our customers. Having your own DR site in the cloud ready and on standby, without having to pay for the hardware, power, bandwidth, cooling, space and system administration and quickly launch resources in cloud, when you really need it (when disaster strikes in your datacenter) makes the AWS cloud the perfect solution for DR. You can quickly recover from a disaster and ensure business continuity of your applications while keeping your costs down. Disaster recovery is about preparing for and recovering from a disaster. Any event that has a negative impact on your business continuity or finances could be termed a disaster. This could be hardware or software failure, a network outage, a power outage, physical damage to a building like fire or flooding, human error, or some other significant disaster. AWS cloud not only makes it cost-effective to do DR in the cloud but also makes it easy, secure and reliable. With APIs and right automation in place, you can fire up and test whether your DR solution really works and be prepared ahead of time. 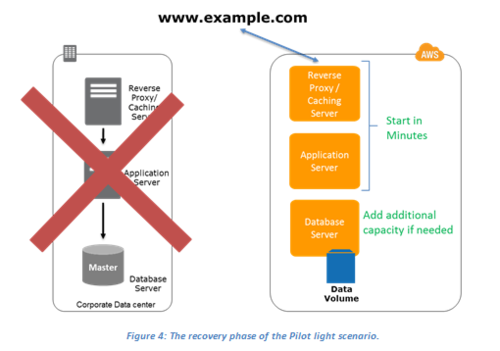 You can reduce your recovery times by quickly provisioning pre-configured resources (AMIs) when you need them or cut-over to an already provisioned DR site (and then scaling gradually as you need). You can bake the necessary security best practices into an AWS CloudFormation template and provision the resources in an Amazon Virtual Private Cloud (VPC). All at the fraction of the cost of conventional DR.
Fast disk-based storage and retrieval of files. Eliminate costs associated with transporting, storing, and retrieving tape media and associated tape backup software. Fast retrieval of files allows you to avoid fines for missing compliance deadlines. Add any amount of data, quickly. Easily expire and delete without handling media. Secure and durable cloud disaster recovery platform with industry-recognized certifications and audits. All of our consultants and engineers are AWS certified and we will work with your team to come up with the best DR solution. In the event of a problem with the AWS infrastructure itself, Amazon will offer a refund in the form of a Service Credit according to their SLAs above. In addition, Easy Cloud will offer a Service Credit of our monthly consulting fee in the amount shown in the table below. The AWS cloud supports many popular disaster recovery (DR) architectures from “pilot light” environments that may be suitable for small customer workload data center failures to “hot standby” environments that enable rapid failover at scale. With data centers in Regions all around the world, AWS provides a set of cloud-based disaster recovery services that enable rapid recovery of your IT infrastructure and data. Depending on your Recovery Time Objective (RTO) and Recovery Point Objective (RPO), you have the flexibility to choose the right approach that fits your budget. The approaches could be as minimum as backup and restore from the cloud or full-scale multi-site solution deployed in onsite and AWS with data replication and mirroring. Although AWS has built a highly redundant and highly available infrastructure, it is up to the customer to utilize these features. With our help, we will recommend a highly available architecture that fits your budget. At a minimum, we would highly recommend that most of our customers utilize AWS features such as Multiple Availability Zones (resources such as database servers are replicated and made available in different geographic regions) along with some type of Pilot Light DR scenario, where a scaled down version of your production environment is ready to be provisioned in the event of a disaster.